Property taxes typically comprise 42% of a building's total operating costs: a staggering tax burden which will get heavier rather than lighter in the years ahead as property assessments climb, waves of civil servants retire and municipalities grapple with funding their generous pension plans. This property tax burden falls right down to a business's bottom line and thus impacts adversely on the rent the tenant can afford to pay for their space. Each year our Property Tax Team conducts property tax appeals on all types of real estate, large and small, automobile dealerships and apartments, container piers and curling rinks, hazardous waste plants and hotels, self-storage facilities and shopping centres … From our offices in Toronto, Saint John, Charlottetown, Halifax and St. John’s they assist property owners coast to coast with assessment appeals, liberating millions of property tax dollars for productive use: money that is used by the private sector to expand, invest in new technology, create jobs and improve profits: capital that would otherwise be squandered by the public sector on misallocated resources. If you are a property owner or occupier in Ontario, New Brunswick, Nova Scotia, Prince Edward Island, Newfoundland, or own a heavy industrial or specialty property anywhere in Canada, we can alleviate your property assessment tax burden by successfully handling the assessment appeal process for you. We believe that our client should know what our property assessment appeal services will cost before we commence the property tax appeal assignment ... there should be no surprises! We therefore enter into a written contract which clearly specifies the scope and cost of our assessment appeal work. 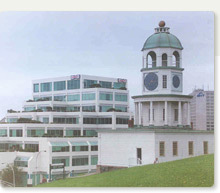 Since we typically employ a potential three step process (assessment audit, negotiation, court) we provide Fee Quotations before commencing each phase of the assessment appeal process so that the client can weigh the cost versus the property tax savings involved and determine whether to utilise our services, proceed alone or abandon the assessment appeal. We have constructed a pricing algorithm which enables us to provide fee quotations based on the type, size and location of the property and the stage of the property tax appeal process. Some clients prefer to limit their risk by opting for a "contingency" rather than a "fixed fee" basis for the property tax appeal. The former is typically computed as 50% of the tax savings. In our experience a contingency fee is almost always more expensive for the owner and usually results in sub-optimal property tax savings because of the temptation to suffice i.e. get the best deal for the tax agent rather than the assessed owner. It is also not possible to proceed to court where the tax agent's remuneration is contingent on the outcome of the assessment appeal since no weight will be placed on the latter's evidence. Whilst it is rarely necessary to take the assessment appeal court route it obviously limits one's negotiating room if the ultimate step, resolution by the Assessment Appeal Board, is only available to the Assessor. These links provide information on the assessment appeal process, relevant case law and our on-going property tax management service PAMS®. Our Property Tax Products Video illustrates the assessment appeal process whilst Property Tax Success Stories detail some of the property tax appeal successes we have had for property owners.